Large windows at the front entrance of a commercial building can really have a large impact on employees, customers and suppliers of a business. The staff at American Mutual Life Association (AMLA) of Cleveland Ohio knew something had to be done with the poor performing aluminum storefront windows. The existing units offered minimal insulation (even with the storms on the outside) and the upper level windows were visibly broken by vandals. With the assistance of the Cleveland Glass Block division of Innovate Building Solutions a solution involving glass block windows at the lower level plus Kalwall translucent insulated panels on the upper level windows was chosen. Learn more below why this hybrid approach (i.e. glass blocks and Kalwall) was used and the benefits these respective products provided AMLA. 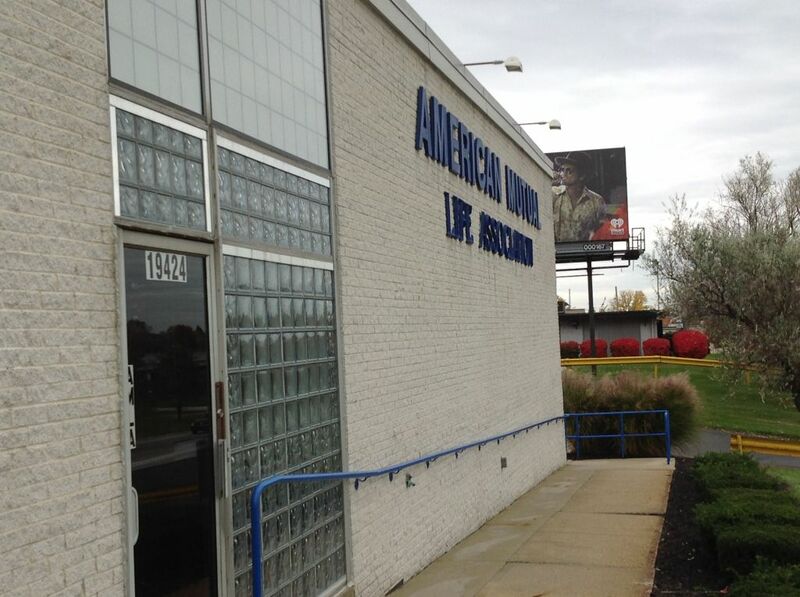 The employees at AMLA did not love the lower level aluminum storefront windows at all! 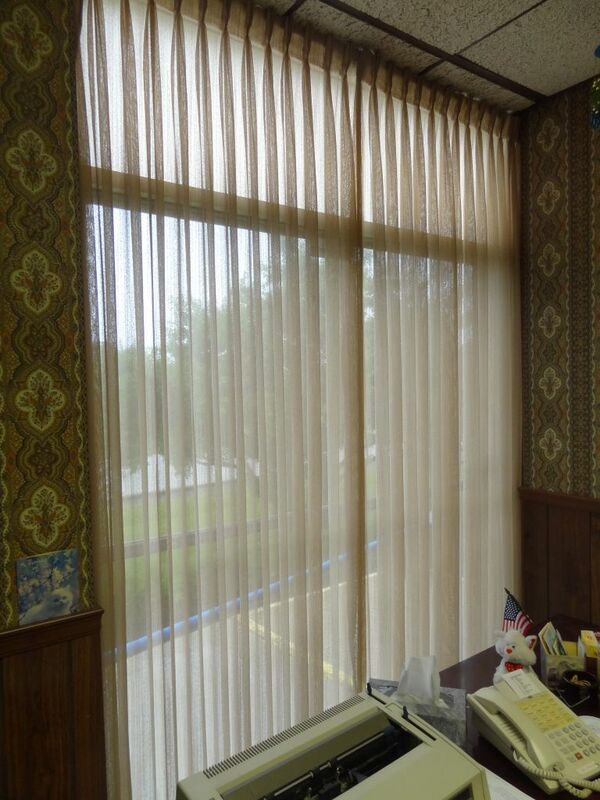 The drafts through the old windows was so bad you could literally see the blinds on the inside move. 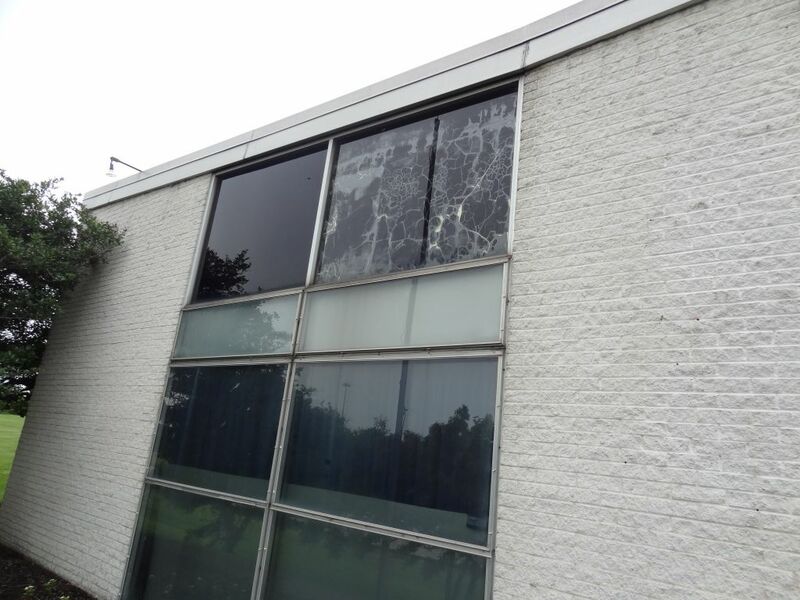 In addition the management team was not fond of the looks of the façade of the building with the broken and old aluminum windows. 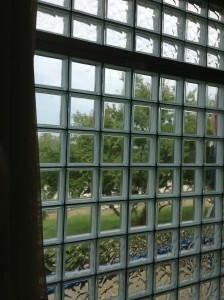 The glass block replacement windows provide a clean, crisp look which has improved the energy efficiency as well. The partially see-through block design offers a nice view to the outside – the staff can now enjoy looking at their flowers in the spring and summer from the inside! A logical question someone might ask is why didn’t AMLA use the same product on the upper level windows as the lower level ones? The answer – this project had two key challenges with the upper level windows that made glass blocks an undesirable solution. Since the upper openings were tapered to match the building’s roof line the glass blocks (which come in square and rectangular sizes) do not have the ability to follow the shape of these upper level openings. 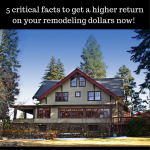 On the inside there is a finished drop ceiling (and the upper level windows are located above the drop ceiling). In order to put in glass blocks the drop ceiling would have to be removed to have enough room to remove the old glass storefront system to have adequate space for the glass blocks. Removal and re-installation of the ceiling would have been expensive and caused a too much disruption to AMLA’s business operations. 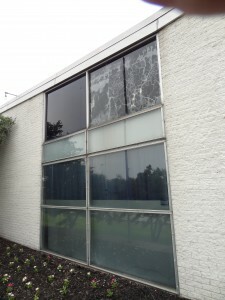 The product selected to overcome these obstacles (while still improving the looks and energy efficiency of the building) was a Kalwall translucent insulated window panel system. 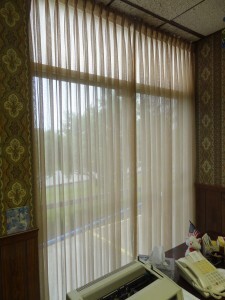 These panels where installed inside of a 1 ¾” thick Kawneer frame which was thin enough to be installed in front of the old aluminum windows. Since the Kalwall system could be placed in front of the old windows there was no need to disturb the drop ceiling in AMLA’s offices. These translucent panels provide an excellent solution because they can be sized to fit virtually any shaped opening (even one like this that is slanted to match the roof line), are energy efficient and also have the flexibility to be designed with internal grids (in this case the grids were made to look similar to the glass block units in the windows below). What do you think about the glass block and Kalwall translucent insulated panels used on this project? 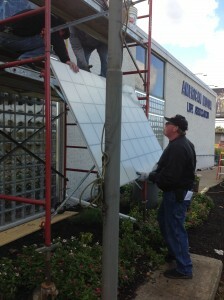 Do you have any questions we can answer about the installation? Please comment below. 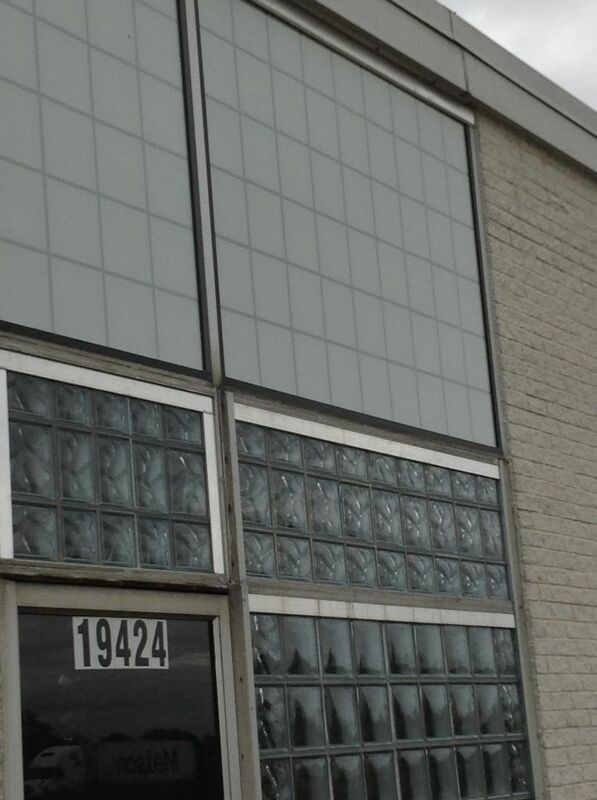 To learn more about replacing aluminum storefront windows with glass blocks or translucent insulated panels or get a free estimate call Innovate Building Solutions (877-668-5888) or for a local project their divisions including Columbus Glass Block (614-252-5888), Cleveland Glass Block (216-531-6363), West Side Glass Block (216-398-1020) or Mid America Glass Block (513-742-5900) of Cincinnati or Dayton and Akron (330-633-2900).